Remember Gendry? We last saw him rowing away to safety and haven’t heard of him since. It is thought he reunited with the Brotherhood Without Banners. Some also suggest that he would go to the Wall and take the place of the smith there and forge Valyrian steel swords to take down the White Walkers. This seems like a long shot. But the wackiest of all theories suggest that he is the legitimate son of Robert Baratheon and...hold your breath....Cersei Lannister. Remember how Cersei talks of losing a “black-haired” child to fever when Catelyn is at Bran’s bedside in S1? Even Gendry remembers a mother who had blonde hair. If this is revealed, we have our One True King, people! In S5E01, a young Cersei meets the fortune teller Maggy who predicts the promiscuity of her betrothed Robert Baratheon, the death of her children and her own shaky crown. In the books however, another prophecy is mentioned - her death by a Valonqar. In High Valyrian, Valonqar translates to “little brother”. However, High Valyrian is gender neutral and nowhere in the books is it specified that the brother (or sister) will be Cersei’s own. This makes a strong case for almost half of our principal characters: both of Cersei’s brothers (Jaime is technically younger), all of the remaining Stark children, Daenerys, Sandor Clegane - all of whom have very good reasons to see Cersei dead. We do not know much about the High Sparrow except that he was a very rich man who renounced it all for a life of piety. But some maesters from the internet suggest that he is none other than Howland Reed, Lord of Greywater Watch and father of Meera and Jojen. Evidence? The books’ description of the High Sparrow matches that of the crannogmen - from whom the Reeds are descended. House Reed pledged allegiance to House Stark, which would explain why the High Sparrow is so intent on punishing the Lannisters for their deeds. Far-fetched, yes, but plausible. This nondescript building in Dorne holds so many mysteries. We cannot wait for Bran to uncover the secrets about this place. However, there is another man who could hold the key. If the High Sparrow is indeed Howland Reed, he accompanied Ned Stark to the Tower of Joy, and hence knows what truly happened. Was Lyanna held there by force or by choice? Did Ned find Lyanna with a newborn son? Is R+L actually equal to J? So many questions! We saw how the Night King was able to force his way into the haven of the Children of the Forest after he had touched Bran. Now the Wall is magicked similarly to keep out the White Walkers. If Bran crosses the Wall, the Night King can follow. 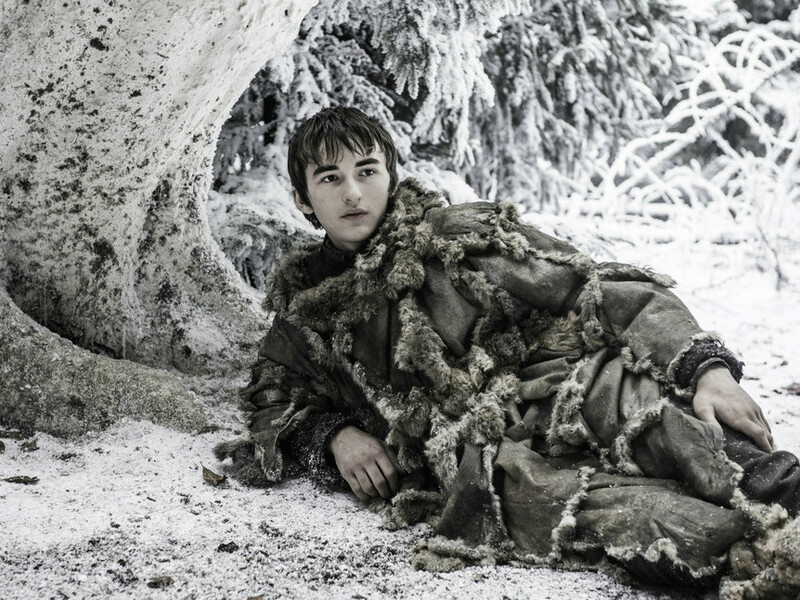 Theories suggest that Bran (because of his ability to Warg through time AND space) is in fact Bran the Builder, the Stark who raised the Wall centuries ago. Knowing Bran’s penchant for wrecking everything around him, it would be a nice touch if the Builder himself led to the Fall of the Wall, and brought in Winter with him! Aegon Targaryen is the son of slain Prince Rhaegar, and hence Dany’s nephew. It is said that the prince, aged two at the time of Robert Baratheon’s rebelliSon, was whisked away to safety with a caretaker. Varys has received whispers of his being alive, and if he is found, he would be a stronger contender to the Iron Throne than anybody else. Said the despicable Ramsay to Sansa before being chewed up by his own hounds. This, and the finale preview has set off speculations of the worst kind. Is Sansa pregnant with the devil’s child? Will that force her to marry Petyr Baelish (as the preview seems to indicate), or that creepy Lord of the Eyrie Robert Arryn? Again, there are arguments to the contrary and this is one theory we hope does not hold a single drop of water. In S05E06, Littlefinger and Cersei have an exchange wherein Baelish asks for wardenship of the North in exchange for attacking Winterfell with the Knights of the Vale. While Cersei is no longer in power and Littlefinger didn’t need to attack the Stark stronghold, he is very much in a position to become the de facto ruler of the North. Sansa and Jon are indeed surrounded by enemies! The preview shows Jaime Lannister with Walder Frey at the Twins, with Frey mouthing those ominous lines “The Freys and the Lannisters send their regards”. It has been speculated that Arya might take a detour on her way home and give her own ‘regards’ to Walder Frey and others who butchered her family. Now that she is no longer No One but as ruthless a killer as Jaqen H’ghar, this is one conjecture we definitely want to see coming true! Some eagle-eyed book nerds have theorised that Jon, in true Star Wars style, also has a secret twin sister. Who, you ask? No one but Meera Reed. Remember how Ned and Howland Reed were the only two survivors of the duel outside the Tower of Joy? It is quite probably that Ned found Lyanna with not one but two babies. Even if the similar appearance of actors Kit Harington and Ellie Kendrick is dismissed, the books say that Meera and Jon are the SAME AGE. Meera is described as slim with brown hair, much like Arya, who is closest in appearance to Jon! You’re welcome. What are your thoughts about the season finale? Share with us in the comments below?